Rev. Kyle Ferguson was installed as pastor at Westminster in early 2013, moving with his wife, Michelle, and children from Wisconsin. The Ferguson clan includes six children: Ciara, Elayna, Tyler, Aubrey, Kaleb, and Amaria. A graduate of Trinity College and Trinity Evangelical Divinity School in Illinois, Kyle was ordained as a PCA Teaching Elder in 2008, following in the footsteps of his father, Rev. James E. Ferguson, and his grandfather, Rev. H. James Ferguson. 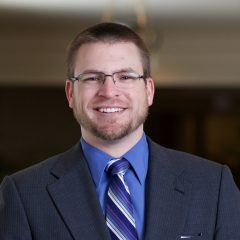 Prior to pastoring Westminster, Kyle served as Youth Director and then Pastor of Family Ministries at Cornerstone Presbyterian in Delafield, Wisconsin under Rev. Christopher Vogel from 2001-2013. As for the summer of 2016, Kyle is pursuing a PhD in Old Testament from Midwestern Seminary (MBTS) in Kansas City, Missouri. In additional to pastoral duties and academic pursuits, Kyle is also a chaplain with Roanoke City Fire-EMS and Roanoke County Fire and Rescue. In his free time, Kyle enjoys spending time with his family, running, working on his house, and trying to read all the books in his library.